Have you ever been slapped by Google? Take it from me, it’s not pleasant. I was one of many people who, for some reason, used to think ranking well in Google was all about finding some magic formula. Put your main key phrase in the text early and often. Buy text links from sites with high pagerank. If I could just find that right mix, my web site would rank well and it would be smooth sailing from there! Then, without notice… SLAP! Google notices you are trying to beat them at their own game, and sends your site so far down the list of search results, you couldn’t find it if you tried. It took multiple Google penalties (and some videos from Matt Cutts) for me to finally realize what ranking well in Google is all about. I’m going to reveal that to you, but first let’s take a step back and talk about Google for a moment. Google is a publicly traded company. They have one responsibility, and that is to provide value to their shareholders. They do this by making money. So, how does Google make money? It delivers the best possible search results that keep people coming to them when they want to find something online. They display relevant advertising in the search results, and make this advertising affordable for everyone. As you can see, showing the best possible search results is the core of their business. Without great results, people might think to try another search engine to find what they are looking for. Because of this, Google will stop at nothing to weed out weak content, and sites that don’t provide a lot of value to its searchers. The bottom line? The surest way to consistently rank well in Google is to make the internet better as a whole. You need to make great content, or provide a service that people absolutely love, and want to tell others about. There is no magic formula, and if you try to manipulate their search results, they will more than likely find out about it and penalize you for it. Don’t buy or sell links. Editorially chosen links to your site is pretty much one of the most important factors in getting your site to rank well in search engines. Google looks at these links as a vote… or a recommendation from someone else that your site must be great. But don’t let this knowledge temp you to buy or sell these votes. Google has made it a mission to determine the difference between a good editorially chosen link, and a link that might have been bought or sold. If they believe you are buying or selling links, the best case scenario is they distrust your website, which will result in lower rankings. The worst case scenario is they will ban you all together. I used to actively buy and sell links, and take it from me… it might take them time, but Google WILL find out about it! Either their algorithms will notice, or your competition will manually report you. Get social. Google is admitting they are putting an increased importance on social factors, when it comes to their rankings. They are starting to connect web sites with their social media presence, and when people naturally like, retweet, and share your posts… they take note of that, and factor it in your rankings. Be everywhere. Learn how to be everywhere online. Every time you get noticed online, it provides you with an opportunity to connect with someone who could become your next brand advocate. Someone who just loves what you do, and wants to send you customers and tell the world about you. Being everywhere again starts with social media. Saying that, it’s not just about social media. It’s also about having a YouTube presence. It is about getting to know your peers and treating them like gold, not competition. It’s about agreeing to be interviewed for a blog post, if the opportunity comes up. The more opportunities you have to get noticed online, the better. Create a quality web site. You need to create a web site that looks great, and is easy to navigate. If you have advertising on your web site, don’t put so much advertising that it distracts from the actual content. Make it easy to contact you, or leave comments. In your text, include relevant key phrases that people might use to find you but don’t overdo it, or do anything unnatural. While the affordable cost and near instant results may be tempting, just know that in the long term, an SEO strategy that aims to trick search engines into giving you better rankings will never be a winning strategy. Eventually, you will get caught and penalized. Even as someone who has been penalized by Google many times, I have really grown to appreciate what they are doing. As I mentioned before, all they care about is delivering the best possible search results to those who are utilizing their search engine. They are trying to be the best they can be, and add value to the internet as a whole. I think it’s fair if all they ask is we do the same. The good news is I believe it is a way easier long term strategy to play by the rules. When I think of the time I wasted by trying to beat Google, I kind of laugh. The time I spent trying find some magic formula could have just been spent creating the best possible content, and building a community around it. Still, I argue it is better starting late with this strategy than never. I also hope knowing this helps you. 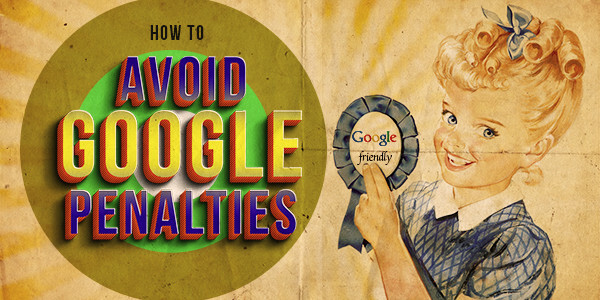 As always, if you think I missed anything in regards to Google penalties that people should know about, or if you have any questions… please let me know. My social links used to show up on Moz but at the same time my site dropped a few spots in ranking, my social links disappeared at the same time. I wonder if I was slapped at all? And for what? They were all quality social links.